Celebrating the spirit of womanhood, and achievements Aspen watches felicitated International players, Bhagyashri Kolte, Pooja Sahasrabudhe, Rutuja Satpute, Coach Mrunalini Kunte- Aurangabadkar and women Sports Journalist Poonam Kate. 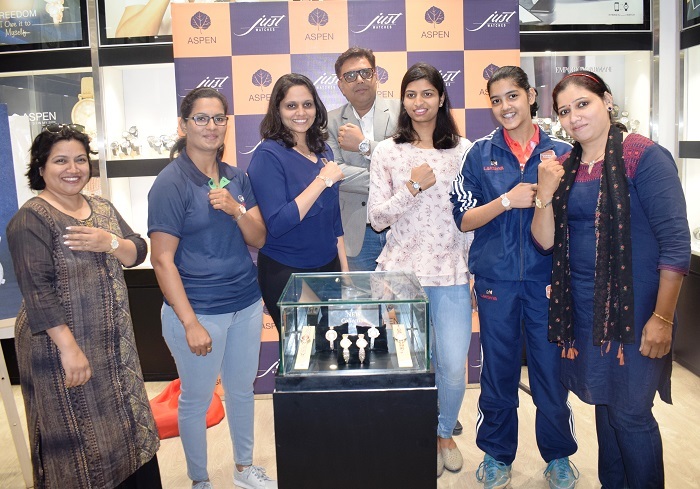 Aspen predominately a ladies watch brand which resonates with an undaunted woman launched its new collection “Jewels” at the hands of these women achievers in a novel function at “Just Watches” store at Westend Mall in Aundh, Pune. The guest list included the women who have carved their niche and are the very best in their fields which included India No. 3 Archer & winner of the Shiv Chhatrapati award Ms. Bhagyashri Kolte - Commonwealth Games Gold medalist, table tennis player, Ms. Pooja Sahasrabudhe - Upcoming junior and state No. 1 Table tennis player under 16 group Ms. Prita Vartikar - Women Chess Grand Master & coach and winner of The Shiv Chhatrapati Award, Ms. Mrunalini Kunte Aurangabadkar-international cyclist Ms. Rutuja Satpute and city’s lone women Sports Journalist Ms. Poonam Kate. On the occasion, the Aspen launched its new collection “Jewels”. The watches are unique in design and are perfect amalgamation of watches & jewellery. They have used beautiful jewellery elements which make them different from regular watches. Watches are adorned with different chains outsourced from Italy, Russia, China and other countries and unique dials to give watches an extraordinary look. Just watches, is the largest chain in watch retail industry, retailing through 76+ stores in more than 37 cities across India with over 45,000 sq.ft. area. The stores boast an array of a right mix of products with top 50 International and National fashion watch brands like Aspen, Tissot, Fossil, Casio, Diesel, Swatch, Versus, Versace and many more, allowing customers to enjoy a holistic and world-class watch shopping experience. Aimed to create a benchmark in fashion retailing by offering world-class retail brands, ambience and service, Just Watches maintains a constant connection with its customers by offering various occasions where they can experience and buy their favourite brands at affordable prices by getting the best deals.